Our student blogger Bubba Ayoub isn’t just a musician, maker, vintage synth geek, aspiring sound designer, and living example of how Bob’s legacy continues to guide and inspire creativity in all ages. He’s also the author of our “#SynthSolo Saturday” Facebook posts appearing regularly online, nearly every weekend. Love great synth parts? Then you’ll love these videos with Bubba’s commentary. You might also love Bubba’s enthusiasm and his sophisticated appreciation of great music from across the decades. Here’s our irregularly updated archive of all the #Synthsolo Saturday posts from Bubba, starting in May 2014. (And don’t miss the posts that started it all: Epic Synth Parts, and Epic Synth Parts, Part II). Who can say no to great synth sounds and Motown? I have no idea what’s going on here, but I like it more than words can adequately express. So just listen along and join me in wishing that we still lived in a world where this happened on prime time television shows. Illinois band Head East is remembered (when they are remembered at all), for their one and only hit, Never Been Any Reason. But what a tune! They kick things off with the first of several smooth mini-solos using a fat Minimoog sound that just gets better with repeated listens. In the early 70’s Stevie Wonder wrangled complete creative control from Motown records and promptly released several of the most original, inspired, and unique albums of any era. Often playing most if not all of the instruments himself, he also collaborated with Malcolm Cecil and Bob Margouleff, creators of the legendary TONTO synthesizer. For Boogie On Reggae Woman, he played the huge synth together with Cecil and Margouleff, who tweaked the knobs and played the ribbon controller while Wonder played the keyboard. Suzanne Ciani. She has been called the Diva of the Diode, and Queen of the Soft Drinks (for her sonic logo work including the iconic Coca Cola pop-and-pour sound). Her 1982 album Seven Waves is a masterpiece, filled with beautiful, evocative synthesizer music. “The Fifth Wave” is by a wide margin my favorite track on the record. George Duke (whom you might remember being sampled in an earlier #SynthSolo Saturday) was one of the original kings of synth-shredding, as shown in this clip of him playing drummer Billy Cobham’s “Stratus” with a star-studded band at 1976’s Montreux Jazz Festival. Electric Light Orchestra used Minimoogs extensively in the ’70s. I can speak from experience that there is nothing quite like putting on ‘Out of the Blue’ for the first time and listening to that positively virtuosic synth bass line that is NOWHERE NEAR LOUD ENOUGH in the mix. REO Speedwagons “Ridin The Storm Out” features an epic Minimoog intro with excellent use of the Minimoog glide feature, something that keyboardists didnt really have until synthesizers came around. Also, killer filter sweeps throughout the song. The last few #synthsolo Saturdays have focused on technically impressive displays of synth power. This week we’re going to switch it up and look at a song with a great synth sound that just enhances a groovy tune, “December 1963” by Frankie Valli & The Four Seasons. It’s short, sweet, and largely unobtrusive, but that’s what makes it great. Boogie down! Daft Punk’s Thomas Bangalter noticed that few musicians were putting synth solos in songs anymore, so he went into the studio and unleashed a torrent of ecstatic, synth-y goodness over this song. From early adopters in university music labs to deadmau5, the ?#?synthesizer? always fit perfectly into the pantheon of nerdy pursuits. So it’s appropriate that The Big Bang Theory theme song includes a synth solo that once caused this author to listen to it approximately 40 times in a row. 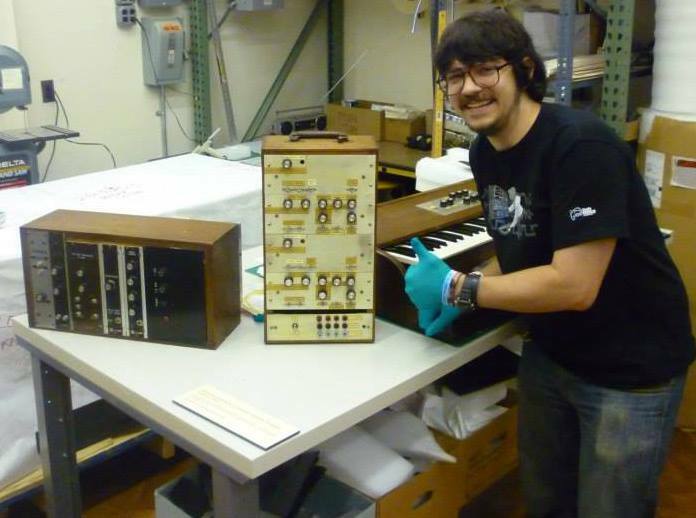 Meet the next generation filled with Bob’s inspiration: BMF student blogger Christian “Bubba” Ayoub (seen here with the “Abominatron,” the first Bob Moog prototype modular) is a former member of the Maker Corps of the Henry Ford Museum, where he designed teaching plans meant to bring innovation into the classroom. He has presented ideas at Maker Faire Detroit, made artbots with June Tinker Hack Invent Saturday, and taught workshops to teachers looking to bring Making to the classroom. He began playing synthesizers at age 10 because of a love for progressive rock bands like Yes and ELP, and voraciously seeks new and interesting music to listen to. His Juggable Offense music project is an ever-shifting mass of psychedelic space rock centered around modular synthesis, Moog equipment, and sonic exploration. Bubba is currently seeking a dual degree in electrical engineering and software engineering (with hopes of a life spent designing and building synthesizers) at the University of Detroit Mercy. Follow him on Twitter at @JuggableOffense, and check him out on SoundCloud.